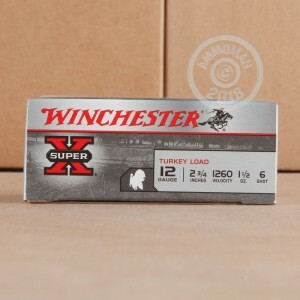 Turkey hunting requires skill, patience, a good shotgun, and a dependable load like this one. 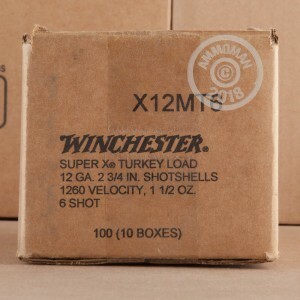 These Winchester 2-3/4"" shells for 12 gauge shotguns come packaged in an economical box of 100 for serious hunters. 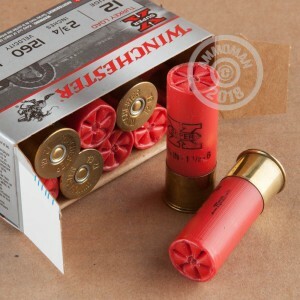 Each shell fires a 1-1/2 oz. of #6 shot at a muzzle velocity of 1,260 feet per second. Winchester Super-X shells deliver strong patterning thanks to their one-piece hinged wad, which also helps to keep recoil down to a manageable level. A 209 primer provides dependable ignition so you'll hear a bang, not a click, when a gobbler is in your sights. Winchester ammo is proudly made in the USA!